Maybe you bought too many bags of cranberries for the holidays or just decided to stock up while they are in season. Although fresh cranberries can last up to four weeks in the refrigerator, you may not be able to use them in that time period. Luckily, frozen cranberries work just as well as fresh in cranberry sauces and relish, and will last up to a year when properly stored. This freezing method makes sure the cranberries will remain loose in their freezer bag or container rather than clumping together. That's important because it means you can take out exactly the amount of cranberries you need for a recipe. First, rinse the cranberries under cold water and let them drain in a colander. Sort through the cranberries and remove any that are shriveled, mushy, or green. Compost or discard those. Also, pick out and get rid of any stems. Spread the cranberries out on a dishtowel and let them air dry for about 15 minutes. Now spread the cranberries in a single layer on a baking sheet with sides (a jelly roll pan), or on a dish. Put the cranberries in the freezer, uncovered, for 2 to 8 hours. Less than 2 hours may not fully freeze the cranberries, but be sure not to leave them in longer than 8 hours, or they will get freezer burn. Cranberry sauce recipes typically use 12 ounces of fruit (the amount in most commercially sold bags of cranberries). If you know your frozen cranberries are destined to become a sauce, you may find it easiest to store the berries in 12-ounce batches. 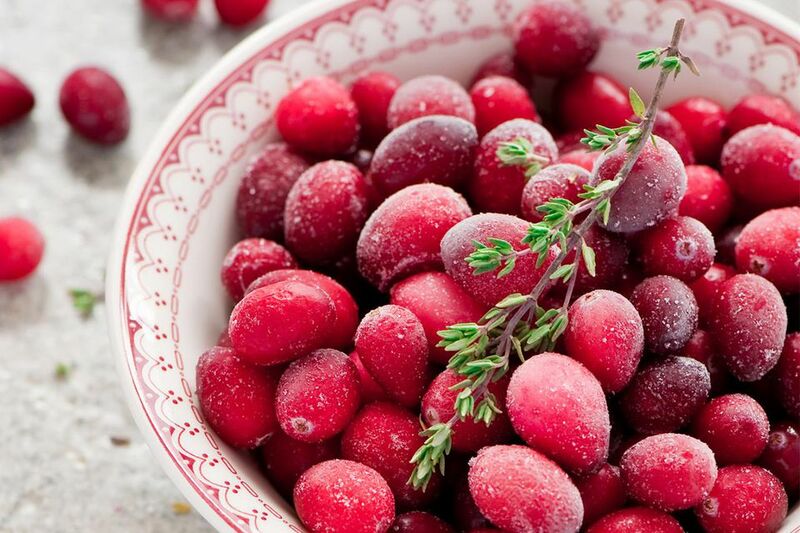 You do not need to thaw frozen cranberries before using them in a recipe. They are better than fresh berries in muffins, quick bread, and other baked goods because they heat through during cooking, but they don't "bleed" their color into the food as much. In addition to cranberry sauces and relishes, and sweet baked goods, there are some other ideas for using frozen strawberries such as in pancakes, smoothies, blended into salad dressings, or in a chutney. What is The Best Way to Freeze Currants? If You're Lucky Enough to Have Too Many Ripe Berries, Freeze Them! Too Many Peaches? Freeze 'Em!